Abstract: Objective To investigate the importance of maxium standardized uptake value(SUVmax), metabolizable tumor volume (MTV), and total glycolysis volume (TLG) of 18F-FDG PET/CT in predicting high-and low-risk groups of patients with endometrial cancer and their diagnostic efficacy. Methods We retrospectively collected the clinical pathological data of 44 patients with endometrial cancer from August 2008 to February 2017 in the PET/CT center at our hospital. The patients were divided into high-and low-risk groups based on the degree of invasion and clinicopathological features of the disease. Region of interest was automatically delineated via the percent threshold method(40% threshold of SUVmax) by using the PET VACR software of GE PET/CT AW4.6 workstation in the United States. SUVmax, MTV, and TLG were automatically generated. Mann-Whitney U test was performed to analyze the differences between SUVmax, MTV, and TLG in the high-and low-risk groups. 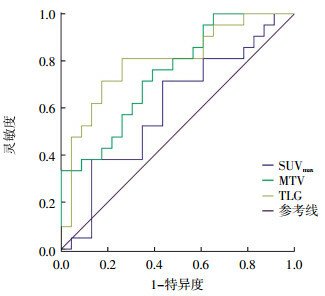 ROC curves were obtained to determine whether SUVmax, MTV, and TLG could predict high-and low-risk groups and to reveal their predictive power. Results The high-and low-risk groups yielded SUVmax of 14.54±6.54 and 13.06±8.51, respectively, and their difference was not significant(Z=-1.163, P=0.245). MTV and TLG[(MTV=17.86±19.32) mL], [TLG=(152.00±178.74) g] of the high-risk group were significantly higher than those of the low-risk group[(MTV=(7.38±5.00) mL], [TLG=(54.89±80.00) g], their difference was significant(Z=-2.808, P=0.005; Z=-3.395, P=0.001). The ROC curve analysis indicated that high-and low-risk groups could be predicted by MTV and TLG but not by SUVmax. The optimal prediction effectiveness was obtained at MTV=7.44 mL and TLV=55.52 g. The sensitivity, specificity, negative predictive value, positive predictive value, and precision rate were 76%, 61%, 72%, 68%, and 70% in MTV and 81%, 74%, 81%, 77%, and 78% in TLG, respectively. Conclusion MTV and TLG are superior to SUVmax in predicting high-and low-risk groups of endometrial cancer. 廖琴平, 杨曦. 子宫内膜癌筛查及早期诊断的现状及展望[J]. 实用妇产科杂志, 2015, 31(7): 481–484. Liao QP, Yang X. Current status and Prospect of screening andearly diagnosis of endometrial cancer[J]. J Pract Obstet Gynecol, 2015, 31(7): 481–484. Walentowicz-Sadlecka M, Malkowski B, Walentowicz P, et al. 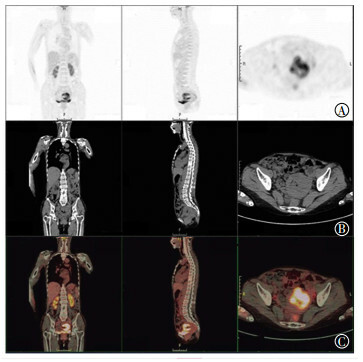 The preoperative maximum standardized uptake value measured by 18F-FDG PET/CT as an independent prognostic factor of overall survival in endometrial cancer patients[J/OL]. Biomed Res Int, 2014, 2014: 234813[2017-11-28]. https: //www. hindawi. com/journals/bmri/2014/234813/. DOI: 10.1155/2014/234813.